Aside from reading the Biblical account of Easter, it can be challenging to find ways to teach your kids about Easter. The internet is filled with Easter crafts, printables and resources that have nothing to do with the real story of Easter. Eggs, bunnies and baby chicks abound when you search anything including the word ‘Easter’. When you look for ‘Christian Easter’ activities and/or resources, you’ll find that most of them include crosses. While that is part of the true story of Easter, it is not the most important part! One of the easiest ways to teach your kids about Easter is through music. I love hymns. So much in fact, that I created a playlist on YouTube featuring my favorite hymns. I grew up singing them in church and began playing them on the piano at a young age as well. Oftentimes throughout the day, I’ll find myself humming, whistling or singing a hymn that I learned as a child. Teaching your kids about Easter through music is easily done using hymns, as there are countless hymns that tell of Easter’s true story! Having a hymnal on hand for your children to use as part of your Easter music study is recommended. It will help them learn the lyrics and your musicians can use them to play the hymns on their instruments as well. I’ve used many different hymnals over the years and Great Hymns of the Faith is my absolute favorite! We are more likely to remember words that we write down. Using copywork is a great way to encourage your children to remember the story of Easter and work on their handwriting as well. These free music notebooking pages work great for that! Hymns often contain words that aren’t used in today’s dialogue. This is a great opportunity for your children to build their vocabulary as they study Easter. Have your musicians pick their favorite Easter hymn and learn the music to play on their instrument of choice. You could also choose a hymn together as a family and work on singing it in parts! My Easter Hymn playlist on YouTube can help you learn lyrics, music or simply play it as part of your Easter studies. 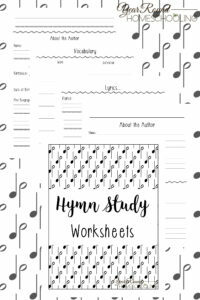 If you have a composer in the family, these free sheet music pages might inspire them to write an Easter hymn of their own! Learning about the author of your favorite hymns gives you insight into their thoughts, life and stories behind their songs. This is a great way to encourage your children to read biographies and learn a bit about history. Easter hymns cover different parts of the Easter story. Teach your children how to organize and put things in the correct order, by listing the hymns in order of the Easter story; death, burial and resurrection. If you or your children do not know any of the hymns on this list, you’ll find all of them on my Easter Hymn playlist on YouTube. You just might discover a new favorite hymn! Hymns provide an amazing amount of education for your children’s faith. I encourage you to use hymns in your homeschool as often as you can, it will make a difference in each of your children throughout their lifetimes! How can you bring music into your homeschool this Easter season?